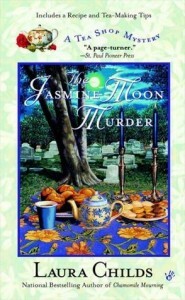 I love to read a good cozy mystery around Halloween. 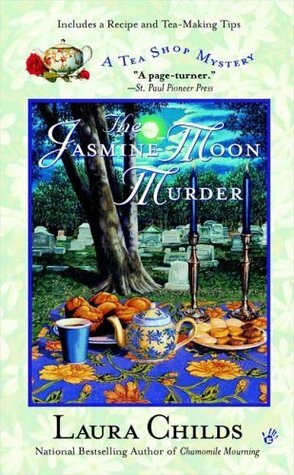 🙂 Right now, I am enjoying one that takes place in October entitled The Jasmine Moon Murder by Laura Childs. It is another in a series I started this summer, set in a South Carolina tea shop. In the back of the book are recipes that compliment the storyline, including a recipe for a dish called Chicken Bog. Doesn’t that sound spooky and Halloweeny? I learned that the dish is a classic in the Lowcountry, and it is called “bog” because it isn’t a soup, but it is very moist. I thought it would be perfect to make to celebrate the Halloween season! 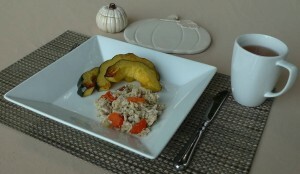 I based my dish on the recipe provided by Laura Childs, but I made a few tweaks of my own. One of the nice things about this recipe is that you also end up with a few cups of chicken stock to freeze for a future dish. It’s always nice to have homemade chicken stock in the freezer, especially now that the season for soups is right around the corner. 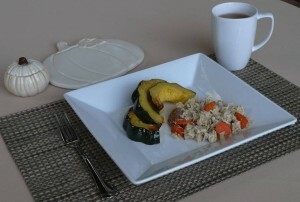 Place the water, onion, salt, chicken, 3 carrots, 3 celery stalks, and peppercorns in a large pot, and bring to a boil. Cover, reduce heat to a simmer, and cook until chicken is tender, about 1 hour. Remove chicken and let cool, reserving the cooking liquid. Let the liquid cool, strain, and skim the fat from the top. Measure 3 ½ cups of the liquid, and pour into a fresh pot. (The remaining liquid can be put into the refrigerator or freezer for a future use.) Remove skin and bones from chicken, and chop into bite sized pieces. Add chicken pieces, remaining 2 carrots, remaining 2 celery stalks, rice, sausage, poultry seasoning, and parsley flakes to the stock. Make sure it is seasoned with enough salt to your liking. Add more if needed. Bring to a boil, cover, and reduce heat to a simmer. 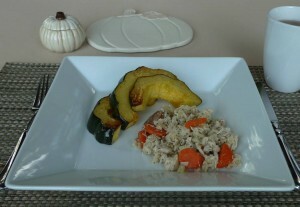 Cook for about 30 minutes, or until the rice is tender.